FIVE STAR (name reserved) is a unique and highly customized Talaria 55 Flybridge. This pedigree yacht has undergone continuous upgrades since new, including a new generator, JetStick II® and Garmin electronics. In 2016, she received new flag blue Awlgrip hull paint from Hinckley Yacht Services and new fabrics throughout. She offers outstanding performance with her advanced MAN V-12 engine package and recently completed the comprehensive A1 engine service. Serviced and stored with Hinckley Yacht Service. 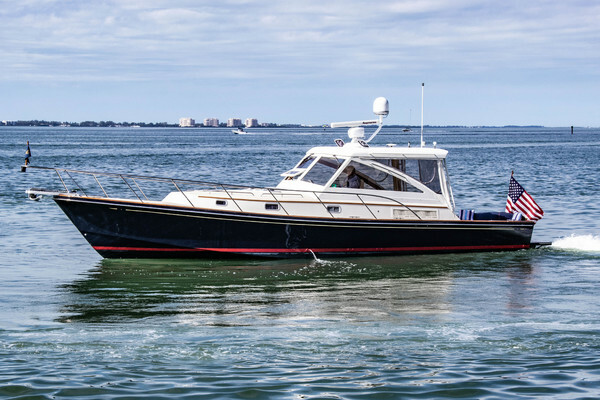 United Yacht Sales New Jersey would love to guide you through a personal showing of this 55' Hinckley Talaria 55 Fb 2006. This yacht for sale is located in St. Michaels, Maryland and priced at $1,950,000. For a showing please contact us by filling out the form on this page and we will get back to you shortly! Talaria 55 Flybridge is the epitome of luxury, style and grace. Her classic style has the added benefit of flybridge for entertaining and feeling the wind in your face. The single cabin is perfect for a cruising couple, and convertible berths can accommodate more guests when the need arises. She boasts a full helm station on the flybridge, and an inside steering section in the pilothouse- both complete with the Hinckley Jetstick joystick system for effortless control. The interior is finished in gloss varnish and raised-panel custom detailing throughout. FIVE STAR features the upgraded Man V-12 engine package that provides an impressive 30kt cruise and blistering near-40 kt top speed. Continuous upgrades and maintenance ensure she is more than ready for her next owner. She conveys with the Hinckley Certified PreOwned warranty. Bridge Clearance: 21’ 6” without antennas CONSTRUCTION Hull: Hinckley DualGuard® Composite Construction- Kevlar®/E-glass outer skin. Aircraft grade end grain balsa below the waterline. Carbon fiber inner skin. Laminated with Vinylester resin using Seaman Composite Resin Infusion Molding Process (SCRIMP®). Deck: E-glass outer and inner skin with aircraft grade end grain balsa and closed cell foam core - laminated with Vinylester resin using Seaman Composite Resin Infusion Molding Process (SCRIMP®). These materials and building techniques provide for a superior surface finish, greater resistance to osmosis, high degree of stiffness & stiffness/weight ratios, and greater hull strength against impact damage and thermal insulation. Non-metallic composite thru-hull fittings with ball valve seacocks are below waterline and above the waterline where appropriate. Bronze seacocks, thru-hull fittings and sea strainers on propulsion engines. Flybridge features helm station with recent Garmin electronics and double-width Stidd chair, two settees and table provide ample seating and entertaining space. Custom Hinckley mast (painted to match cabin top) is aft on the flybridge. It supports a flag halyard, anchor/steaming light, aft deck floodlight and various antennas. Anchor Locker: Molded into the foredeck, with hinged and gas-spring assisted hatch. Custom stainless steel bow roller that allows anchor to be deployed from the helm. Remote control for anchor windlass as well as control at both helm stations makes anchoring this boat simple. A freshwater deck wash is in this foredeck locker. Handrails- Varnished teak handrails are mounted on forward cabin top and full-length the side of pilothouse below windows, port and starboard. (5) Smoke gray tint hatches with stainless steel frames have SkyScreen screens and blinds. The spacious Flybridge features an L-shaped settee with table to starboard and a settee to port. The helm station comprises a double Stidd helm seat and recently upgraded Garmin electronics. Galley Aft: There is a double polished stainless steel sink with Grohe single-lever chrome fixture with sprayer and hot and cold pressure water. Outboard the sink is a top opening freezer. The countertop has a back splash that protects the cherry bulkhead. Over the sink is a custom dish/glass storage area as well as a custom mug storage area. The microwave is mounted outboard of the stove area. Below the sink are two doors to storage space. A dome light is under the storage locker and provides extra light to the sink work area. Galley Outboard: There is a built-in recessed electric cook top with storage drawers under and storage lockers outboard with sliding doors. A trash compactor is under the counter aft and forward is the 2 drawer-style refrigeration system behind cherry fronts. Galley Inboard: There is more counter space with a lift-up hatch to a dry storage area. There are also additional lockers and drawers under the counter in this area. DINETTE: The forward dinette (starboard of the galley) is C-shaped and has a hi/low powered table that converts this area to a double berth. The settee has a Samsung flat-screen TV mounted on aft bulkhead. CUSTOM BAR: High gloss cherry bar is built in forward and features beveled glass doors, leather lined bottle shaped cut-outs, storage below with two shelves, and a Sub-Zero wine cooler. GUEST/DAY HEAD (Port side forward of galley): Just forward of galley on port side is the guest head with varnished cherry vanity and cream gelcoat shower area. Sealand Vacu-flush marine toilet plumbed directly to 100-gallon holding tank. MASTER STATEROOM: The spacious Master Stateroom has a forward-facing queen berth with a fabric covered cherry headboard, en-suite head with shower and large wrap-around settee forward. MASTER HEAD The en-suite Master Head is aft to port of the master stateroom. The vanity area features varnished cherry with Corian counter and backsplash. The owner’s head also includes separate stall shower finished in Light Cream Gelcoat. The finished interior of the head is gloss-varnished cherry with white fabric overheads, varnished cherry battens, and a varnished teak and tulip cabin sole with a cabin sole cover. The shower area is finished in laminate for ease of cleaning. Remote camera at flybridge –connects to Garmin display for aft cockpit viewing and to camera in engine room. Bose lifestyle 48 surround sound system in salon. Speakers are recessed in valence with cherry trim rings. URC Total Control System for AV control via onboard iPads or personal devices 2016. Custom electrical panel with circuit breakers, meters, switches, and indicator lights. Two (2) 24-Volt-DC battery chargers. One (1) 100-amp for House bank and one (1) 60-amp for starting bank. GENERATOR: Northern Lights (new 2014) 15 Kw generator (1005 hours 6/18), rated for 240-Volts AC, is mounted in a sound shield and is outfitted with DC voltmeter, water temperature gauge, oil pressure gauge, hour meter, control switch, shutdown bypass switch and pre-heat. Marine Air Systems reverse-cycle marine air conditioning - two 24,000 BTU “chilled water” systems with four (4) separate air handlers for the salon, galley and heads, guest cabin and owner’s stateroom. SeaVac® built-in vacuum system with (2) 30 ft. hoses mounted in hanging locker. 55-lb Delta primary anchor with 50’ x 3/8” Grade 40 galvanized chain + 200’ x ¾” three-strand nylon rode. Fire Extinguishers: 2-lb. Type B-1 fire extinguishers for class A, B, and C fires.